You will learn a lot of information about different periods of the history. You will like it, for sure! Mr John Fiske was a great historian. Here is a serie that you could appreciate. There enters now upon the scene a man of whose personality we have a much more distinct conception than we have of Verrazano. As that accomplished Italian is one of the chief glories of the town of Dieppe, so the Breton seaport of St. Malo is famous for its native citizen, Jacques Cartier. His portrait hangs in the town hall. Unfortunately its authenticity is not above question, but if it is not surely a true likeness it deserves to be; it well expresses the earnestness and courage, the refinement and keen intelligence of the great Breton mariner. He had roamed the seas for many years, and had won – and doubtless earned –from Spanish mouths the epithets of "corsair" and "pirate", when at the age of three and forty he was selected by Philippe de Chabot, Admiral of France, to carry on the work of Denys and Aubert and Verrazano, and to bring fresh tidings of the mysterious Square Gulf of Sylvanus. On April 20, 1534, Cartier sailed from St. Malo with two small craft carrying sixty-one men, and made straight for the coast of Labrador, just north of the Straits of Belle Isle, a region already quite familiar to Breton and Norman fishermen. Passing through the straits he skirted the inner coast of Newfoundland southward as far as Cape Ray, whence he crossed to Prince Edward Island, and turned his prows to the north. The oppressive heat of an American July is commemorated in the name which Cartier gave to the Bay of Chaleur. A little further on, at Gaspe, he set up a cross, and with the usual ceremonies took possession of the country in the name of Francis I.
Thence he crossed to the eastern end of Anticosti, and followed the north shore of that island nearly to its western point, when he headed about, and passing through Belle Isle made straight for France, carrying with him a couple of Indians whom he had kidnapped, young warriors from far up the St. Lawrence, who had come down to the sea to catch mackerel in hemp nets. With this voyage of reconnoissance the shadowy Square Gulf of Sylvanus at once becomes clothed with reality. Enough interest was aroused in France to seem to justify another undertaking, and in May, 1535, the gallant Cartier set forth once more, with three small ships and no men. Late in July he passed through the Strait of Belle Isle, and on the loth of August, a day sacred to the martyred St. Lawrence, he gave that name to a small bay on the mainland north of Anticosti. Whales were spouting all around his course as he passed the western point of the island and ploughed into the broad expanse of salt water that seemed to open before him the prospect of a short passage to the Indian Ocean. Day by day, however, the water grew fresher, and by the September morning when he reached the mouth of the Saguenay our explorer was reluctantly convinced that he was not in a strait of the ocean, but in one of the mightiest rivers of the earth. 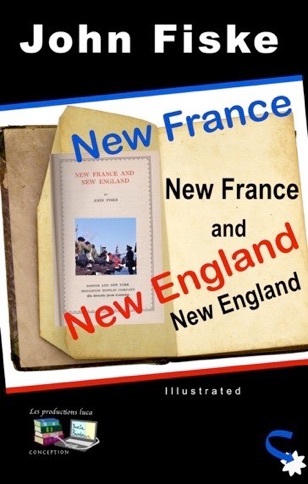 To these newcomers from the Old World each day must have presented an impressive spectacle; for except the Amazon and the Orinoco it may be doubted if there be any river which gives one such an overwhelming sense of power and majesty as the St. Lawrence; certainly the Mississippi seems very tame in comparison. As the Frenchmen inquired the names of the villages along the banks, a reply which they commonly received from their two Indian guides was the word Canada, which is simply a Mohawk word for "village". Hence Cartier naturally got the impression that Canada was the name of the river or of the country through which it flowed, and from these beginnings its meaning has been gradually expanded until it has come to cover half of a huge continent. Presently on arriving at the site of Quebec, Cartier found there a village named Stadacona,with a chieftain called Donnacona. Painted and bedizened warriors and squaws came trooping to the water's edge or paddling out in canoes to meet the astounding spectacle of the white-winged floating castles and their pale-faced and bearded people. 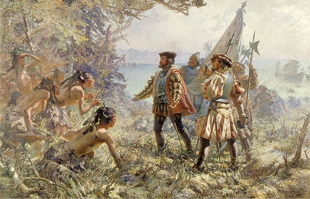 In the two kidnapped interpreters the men of Stadacona quickly recognized their kinsmen; strings of beads were passed about, dusky figures leaped and danced, and doleful yells of welcome resounded through the forest.